When I designed the Clamp Chair, I was driven by the idea to create an comfortable yet simple and light wooden object, that emphasizes the beauty of wood and modern craftsmanship – hence a combination of handcraft and CNC tooling. The principle of a “clamp” shapes the chair consistently and determines its character, which means that the legs are structurally as well as visually interlocking with the corpus, seat and backrest and form eventually a harmonious and seamless unit. The overall construction is reduced to most minimal possible. Our main challenge was to to build a very light and slim looking wooden frame, well balance in proportion with the upholstered seat and backrest. 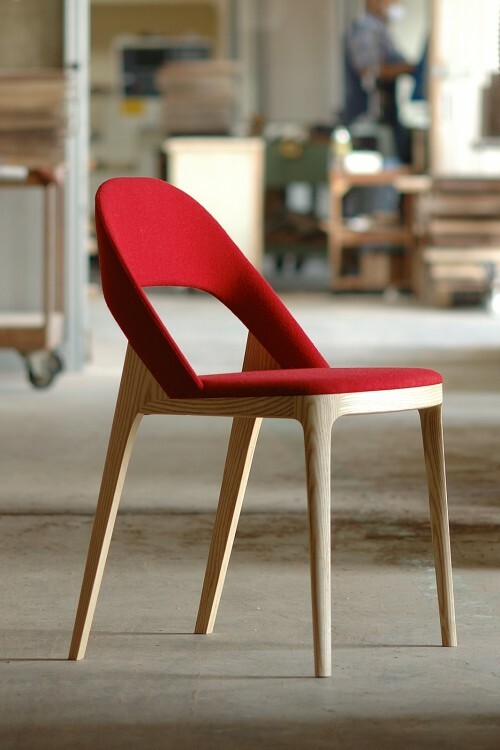 The exceptional experience of Miyazaki, a combination of handcraft and CNC tooling, made it possible to manufacture an extremely slender yet very comfortable chair that appears like an gazelle.